Over the Christmas break I read an interesting book called Weightless, by Sarah Bannan. I say interesting for a number of reasons. Weightless deals with the issue of bullying and, as one critic so succinctly put it, "...the slow cruelty of the crowd." Now, bullying and being bullied is nothing new, however, in our twenty-first century cyber world, online bullying has taken a schoolyard issue to a much greater level. As an avid reader, I found this book an enthralling take on an issue with which many of us are all too familiar, and how small, seemingly insignificant incidents, add up to become something way more and eventually take on a life of their own. Though it falls under the Young Adult category, I would urge all parents to read Weightless then pass it to your children. Alright, I don't want to bang on too much about the ever-increasing bullying problems we have because this book engaged me for other reasons. But I do want to express admiration for this writer who unflinchingly dealt with the bullying issue and teen-suicide. Now, that was my take on Weightless as a reader. As a writer, I don't think I've ever been aware of a book written in the first person plural before. If you're not sure what I mean, here's a run-down. I visited Clara and Meg each afternoon after my lessons. He smiled mysteriously and leaned over to read the cover of her book. See the difference? These two examples are the most common forms of fiction writing. Which is why, when I began reading Weightless, I was at first surprised, then intrigued, then hooked. Third person plural, is similar to its first person cousin but instead of using I, the writer uses we. It's as though the story is being retold by a group of people, We went there, we did this, ate that and then we left. It recounts a shared experience. E.g. : She said such and such and we nodded in agreement. Weightless was written exactly this way and I found it intriguing. Not only as it was immensely readable, but also because the writer didn't have to expressly tell me that the behaviours and experiences described were shared. When writing Torn, I thought very carefully about whether it should be in the first person. I tried writing a couple of chapters in third person and they didn't work quite as well so going with the first person was a conscious decision. Likewise, I can only imagine that Sarah Bannan put similar thought into how she would write Weightless. Now a bit of news. Torn is on sale at Kobo! Not sure if I've already told you this but you can download Torn for only $4.99. If you have the Kobo app on your device, now's your chance to read Torn for half price. In other news, my new website is almost ready for launch. There'll be more information, more pictures and a couple of exciting new services. One will be the opportunity for you to purchase a book directly from me with a personalised message in it. So that's about all for this fortnight. P.S. 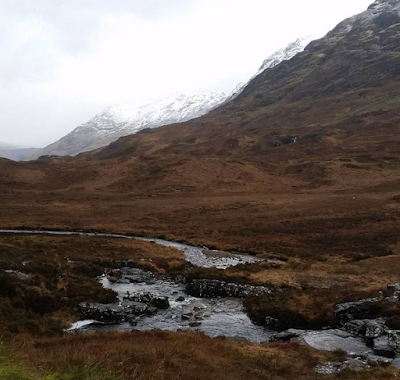 Fans of Diana Gabaldon's Outlander series might like this picture I took last December in the Scottish Highlands.